Alan awoke to find his pillowcase covered in blood. Harsh mid-morning sun streamed in through the window. Daniel must have opened the blinds before he left for work. Alan tightened his grip on the toothbrush as he calculated that this was his fourth nocturnal nosebleed of the year. The first quarter at UCT was still six weeks away. 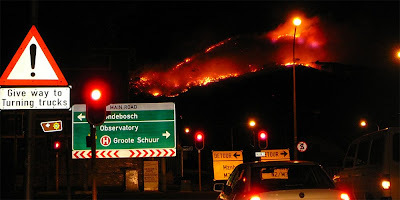 He rinsed the razor under the tap as the reporter on 567 CapeTalk mentioned that Sir Lowry’s Pass was closed to all tourist traffic because of choking smoke. There were fires everywhere. From the historic Vergelegen wine estate in Somerset West to the township of Khayelitsha out on The Flats, it seemed that the whole peninsula would eventually succumb to the blaze. The hot and windy weather was set to continue all through January. Using the wipers, Alan removed a fine layer of ash that had accumulated on his windshield, before driving up to Kirstenbosch. Table Mountain looked much like it always did, but there was something weird about the light today, as if everything was observed through a layer of insipid tea. The modest 1930s architecture of the Compton Herbarium hugged the lower terraces of Kirstenbosch. It held almost a million specimens in its collection, mostly of South African plants, but also a few important species from other parts of the world. ‘Ooh… okay,’ she said eventually, lifting the receiver. ‘I’ll check to see if she’s in. Please sign the visitor’s book and have a seat.’ The girl seemed really young and a tad overanxious. Must be a first year student on a summer internship, he thought to himself. They always end up spending most of it indoors, making copies and manning the front desk. ‘No-no, on the contrary, the tangents were a welcome break from all those boring talks on carbon credits and environmental policy. Please.’ Olivia showed Alan to a small conference table in the library, which smelled of crumbling monographs and ozone from the photocopier. They started drawing up equipment lists and designing an itinerary. It was an impromptu thing, this fieldtrip, hardly more than a month or so in the planning. ‘That’s a terrestrial orchid, isn’t it?’ interrupted Alan. ‘I’m just excited to get out there. Ever since those Darwin Initiative guys from Kew discovered it, I’ve been dying to go and do a proper census of all the caudiciform succulents, perhaps with a slight emphasis on the Euphorbiaceae.’ Alan grinned. ‘No, it’s too short notice, really.’ Alan paused. ‘You realize we might get several papers out of this,’ he said, imagining the grants pouring in. ‘Why don’t we continue this tomorrow over dinner?’ Olivia suggested. Alan found himself strangely attracted to Olivia, on a cerebral level. They shared an intellectual connection, something Alan felt had been lacking in his life lately. No matter how much Daniel seemed to care about him, he never did laugh at Alan’s science jokes. I hope you enjoy the first part of my new work-in-progress, a short story. Look out for Part 2 really soon! *Clapping* It's terrific! When do we get Part II? This is fantastic! Great job, EOH!